Be a human and enter this competition for one of the most touching films of the year. Beautiful Boy is the true story of a family’s turmoil in the face of their son’s addiction and attempts at recovery. Based on memoirs from both father and son, this is a heartbreaking yet joyous picture of what it means to be human in the modern world. 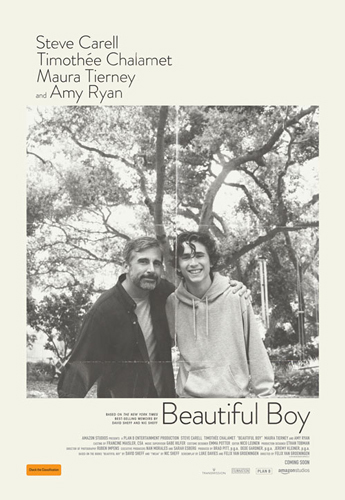 Starring a never-better Steve Carell and future superstar Timothee Chalamet (Call Me By Your Name) and directed by Felix van Groeningen (The Broken Circle Breakdown) from a script that he co-wrote with Luke Davies (Lion, Candy), Beautiful Boy is bound to be your most memorable film of 2018. For your chance to win a double pass to Beautiful Boy, simply answer this question – name your favourite father and son, fictional or otherwise, and why you love them – and email competitions@filmink.com.au by October 23, 2018 for your chance to win. Best 10 entries win! And be sure to include your mailing address in your entry. Beautiful Boy is in cinemas from October 25, 2018.